Hard right? Every parent wants to protect and help his or her little ones, and that’s great! But we think it’s a good idea if your child can come into the gym by himself. We’ll feel really bad pumping them full of sugar if you’re in the gym (kidding). Don’t worry about missing out on anything important. We will always come out to touch base about progress, things to work on at home, etc. But if you’re just curious about what happens with therapy, come on back and check it out. Not every child can handle going into the therapy gym by himself, so if he needs you, ok! That’s fine with us, but let him do the talking if you are in with us. It’s not that we don’t want to hear from you, Parents, but we like to establish good communication and working relationships especially with our younger patients. We’re experts in orthopedic physical therapy, but we can’t feel what your child is feeling, and we’re not with them when they go home, so it’s important to us that young kids feel comfortable telling us how they are doing. So if your child doesn’t give a full answer, or you just want to make a little comment, go ahead and tell us after your child answers. We all need to be motivated sometimes. Help your kids with therapy by reminding them that they will get to return to whatever activity they experienced before. And if they’re having a tough day, perhaps thinking that this is too hard or too much work, remind them that others probably have it tougher than they do. 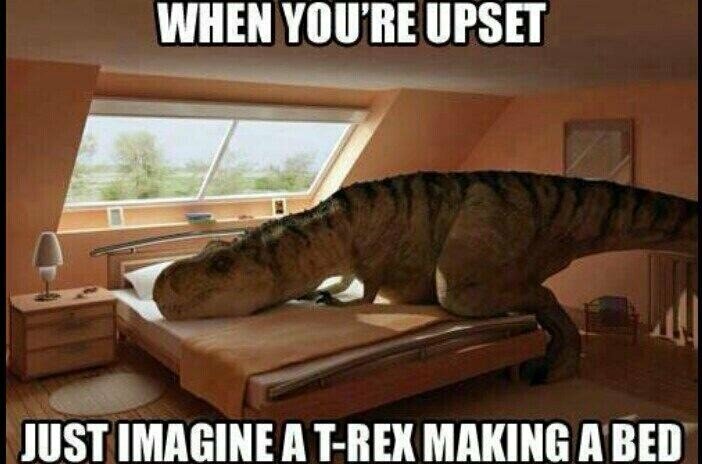 Then show them a picture of a T-Rex making a bed. First thing that makes therapy fun: we never give shots! Whew! I think we can all breathe a sigh of relief on that one. While it’s work, it’s also fun! We like to play games, throw stuff (mainly a ball), run around, and do some serious jumping. Hopefully after the first appointment, any fears will be gone. Your child’s therapist may ask you to test out running and playing at home to see how it goes, so be ready for that, but don’t let them push the boundaries arbitrarily.